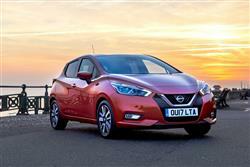 Once again, the Nissan Micra is a very class-competitive, characterful supermini. This time, it's stylish and very good to drive, while setting a high standard with its sense of safety. You know that car in this class you were thinking of? Stack it up against this one. Here, we look at the most popular variant, that fitted out with Nissan's perky IG-T 90 0.9-litre turbo petrol engine. Here's a supermini with a lot to prove. Made by a brand with a lot of ground to make up in this segment. 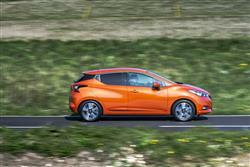 Welcome to the fifth generation Nissan Micra. There certainly are no half-measures this time round, with a full-on European design mostly engineered in the UK and built in the same French Renault plant near Paris that makes that brand's rival Clio model. The Micra shares an evolved version of that car's platform too, but just about everything else here is new, something you'll have already picked up on from a glance at the avant garde looks. They usher in a completely fresh driving experience, with drive dynamics borrowed from larger models in the Nissan line-up. Hi-tech safety and media technology's been democratised for use here too, plus there's a far more pleasingly designed cabin that offers more space and can be embellished with some tempting customer options. We thought we'd put it all to the test at the wheel of the volume IG-T 90 petrol variant. One of the reasons that Nissan has been so freed up to develop other aspects of this Micra is that it hasn't had to worry much about the oily bits. 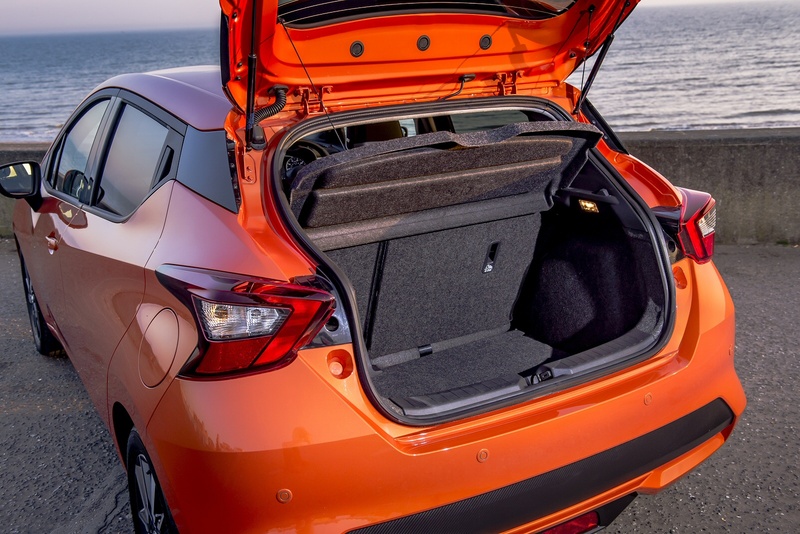 As with the basic platform of this car, these come directly from Renault's fourth generation Clio, with most buyers likely to select between the pair of three cylinder petrol engines on offer. There's a 71PS 1.0-litre normally aspirated unit, but we'd urge you to try and stretch to the preferable 0.9-litre 'IG-T 90' turbo powerplant we tried, a variant that mixes peppier performance with more acceptable economy. 62mph from rest takes 12.1s en route to 109mph. 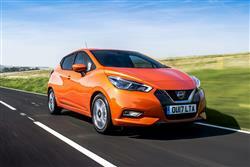 What isn't typical in this segment is the level of electronic sophistication that this Micra delivers as standard. 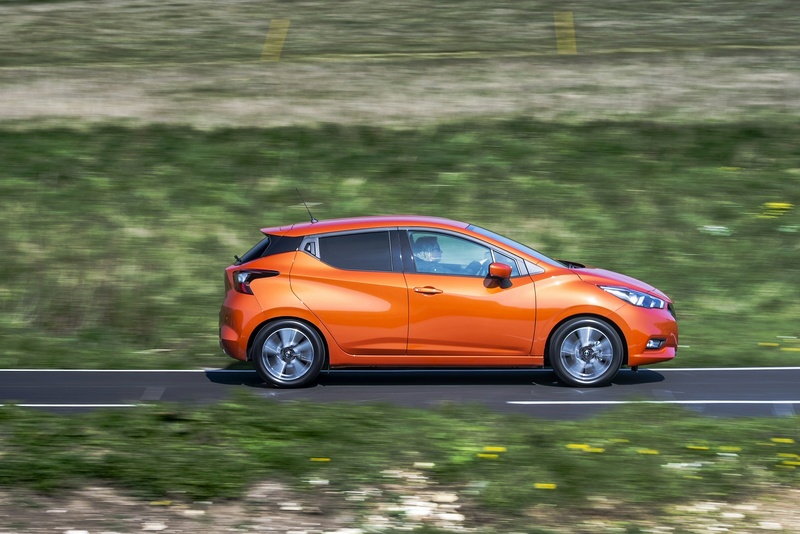 All models get Nissan's 'Chassis Control' package incorporating 'Active Trace Control' (which helps corner turn-in) and 'Active Ride Control' (which calms the body pitching you'd normally get over sharper bumps). 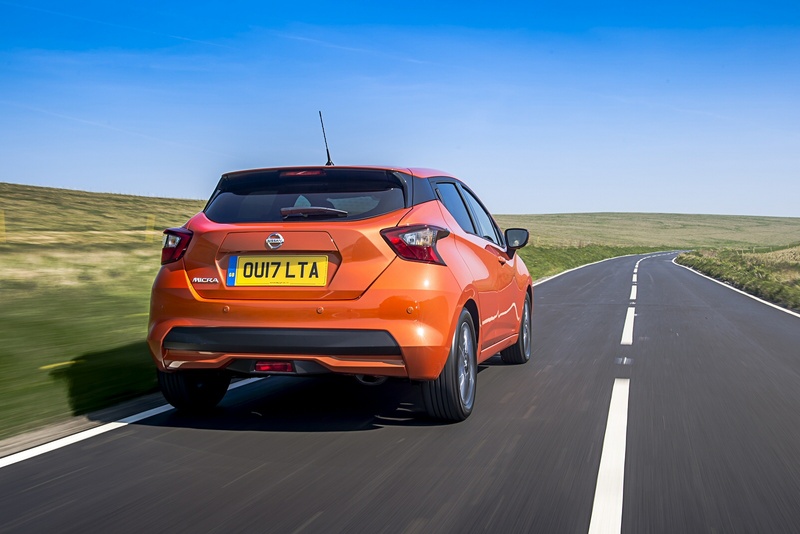 Both systems use automatic and very subtle brake application and give a more fluid, flowing feel to the way this Micra progresses down the road. The rather firm suspension can't quite complement this and we'd like a little more feel at speed from the steering but otherwise, we're impressed with the drive dynamics on offer here. 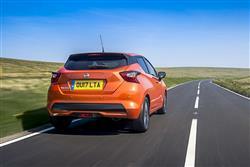 In the class, only Ford's Fiesta is more fun to punt along. 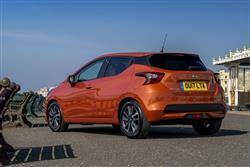 In short, it's all a huge step forward from anything the Micra model line has served up before. Expressive and emotive, this is the kind of shape you'd more readily associate with a motorshow concept car than a production model, with an athletic silhouette that's much longer, lower and wider than what was offered before. 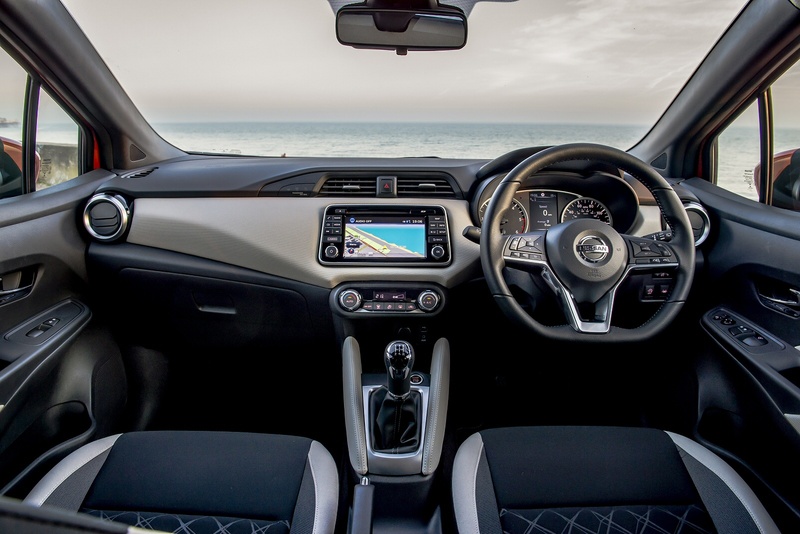 Inside, things have been much enhanced over what went before, the fascia based around what Nissan calls a 'gliding wing' dashboard layout which feels of much higher quality and can be personalised with colour-coded versions of this centre panel. Through the 'D'-shaped multi-function steering wheel, the instrument cluster is much as you'd find it on a more expensive Qashqai crossover model. The incorporated 5-inch TFT screen can either be set to show everything from navigation to performance data. Or it can be used to customise many of the car's electronic systems. Anything this monitor can't tell you will probably be covered off by the 7-inch centre-dash infotainment touchscreen you get providing you avoid entry-level trim. Probably, the extra technology helps influence the greater perception of quality this time round and our favourite touch is the optional 'BOSE Personal Premium Audio System' which comes with two speakers actually built into the driver's head rest. Rear seat headroom is restricted as a result of the swept-back roofline but in compensation, there's a decently-sized 300-litre boot. Price isn't the only determining factor in supermini segment success. If it was, then the previous generation version of this car would still have sold in reasonable numbers. Still, Nissan knows that if it's to achieve its target of making this a top ten segment contender, then it must be costed very competitively. The technology included here prevents the Japanese maker pitching this car at budget brand levels, but a sharp pricing span that will see most models sell in the £13,000 to £20,000 bracket gives dealers plenty to work with. The IG-T 90 0.9-litre petrol turbo variant we tried is priced from around £15,000. With this engine, all variants get niceties like air conditioning, front foglamps, rain-sensing wipers and 'Intelligent' auto headlights that dip themselves at night in the face of oncoming traffic. You also get a rear roof spoiler, LED daytime running lights, a trip computer, a height-adjustable driver's seat, remote central locking, a stereo with Bluetooth connections and the 60:40 split-folding rear seatback that some rivals make you do without at this level. We'd question the lack of a DAB radio at this level (and the rather feeble two-speaker audio set-up) but apart from that, the key items are pretty much all there. Plus there's a much higher-than-average level of safety equipment - including autonomous braking, lane departure warning and a lane weaving aid. As for the figures, well it may seem a touch counter-intuitive that the more powerful 90PS turbo unit is cleaner and more frugal than the base 71PS normally aspirated engine, but that's mainly because, for reasons best known to Nissan, the entry-level unit can't be specified with an engine start/stop system. This budget powerplant manages 46.3mpg on the combined cycle and 121g/km of CO2 (WLTP), figures the 'IGT-90' turbo model improves to 47.1mpg and 118g/km (WLTP). On the top 'Tekna' model we tried, the use of larger 17-inch wheels will hit those returns by around 5%. What about other running cost issues? Well, service intervals for the petrol engines come round every 12 months or 12,500 miles, depending on which comes soonest. For the turbodiesel motor, the one year period remains the same but you can travel up to 18,500 miles between scheduled stops before any maintenance will be required. 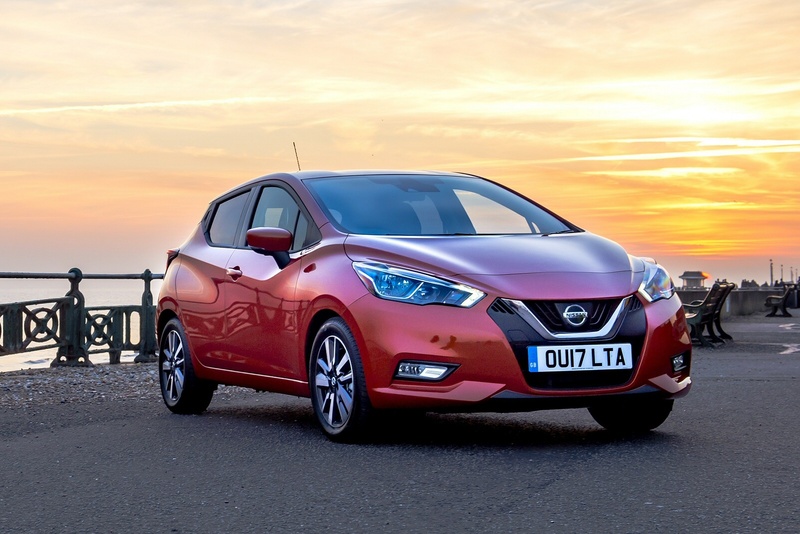 As part of any Nissan dealer visit with your car, you'll be provided with a free courtesy vehicle and a video health check for your Micra that you can watch on your 'phone or computer. 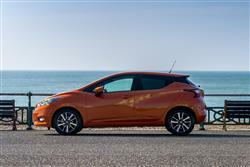 Nissan also provides a three year, 60,000-mile warranty as standard and that can be lengthened to four years but with the same mileage cap. If you�re looking for a new Nissan Micra 0.9 IG-T Tekna 5dr [Exterior+ Pack] Petrol Hatchback for sale, you�ve come to the right place. 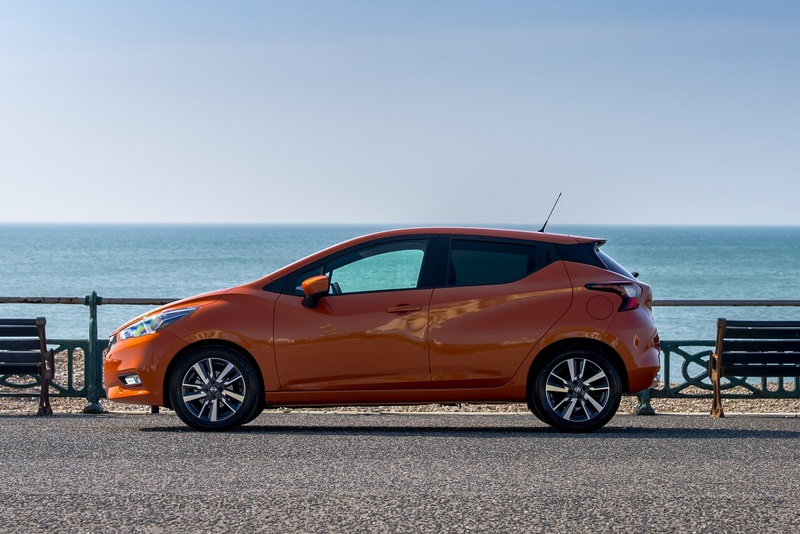 At Bristol Street Motors we don�t just have the best Nissan Micra 0.9 IG-T Tekna 5dr [Exterior+ Pack] Petrol Hatchback deals, we also offer friendly advice and help with all your enquiries to ensure your buying experience is a happy experience.